Two thousand people attend Freedom Day rally. Fund of Ideas delivers CSR awards to Belarusian companies. CityDog rolls out competition for creative solution of Minsk urban issues. EuroBelarus holds international conference on civil society at local level. MediaBarCamp 2014 continues to accept applications until April 7. EU notes positive trends in Belarus’ cooperation with international community on death penalty and higher education. Electby.org recorded the record number of violations at the local elections. 635 violations during the recent local elections were recorded on the interactive map Electby.org. This is a record number of violations of the electoral process, starting since 2010, when the platform of civic monitoring of elections was launched. The traditional "leader" in the violations became the category of "Early voting." Some 2,000 people attend Freedom Day rally. 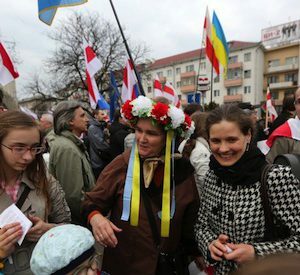 On 25 March an estimated 2,000 people attended a rally that crowned "Dzien Voli" (Freedom Day) demonstration in Minsk. The sanctioned event was staged to mark the 96th anniversary of the proclamation of the Belarusian National Republic (BNR). Ten people were detained after Freedom Day action in Minsk, two of them – activists of European Belarus – were sentenced to administrative arrests. Civic education from Liavon Volski. On 25 March to the Freedom Day, the multi label 34 Piarshak presented a new album of well-known musician Liavon Volsky titled as Social Science/ Hramadaznaūstva. The musician describes his new CD in terms of civic education: "I think that time of compromises ran out. Time of trading, making rules of the game, the inner censor and manoeuvring ran out. Time of Aesopian language, hidden meanings and reading between the lines has passed." For the first two days in the internet the album was downloaded about 20 thousand times. Belarus is to join the largest environmental campaign Earth Hour. On 29 March for one hour from 8.30 to 9.30 the campaign suggests everyone to turn off the lights and unnecessary appliances at home or in the office, and thus try to care about preserving natural resources. The initiator of the Earth Hour campaign in Belarus is Green Alliance together with the Ministry of Natural Resources and Environment. A number of Belarusian artists supported the campaign. Folk Spring meeting. The last weekend was marked with the traditional Spring Meeting/ Hukanne Viasny ceremony, held in different parts of Belarus. The national folklore ritual is designed to greet the coming spring. The Student Ethnographic Society organised a ceremony in Vyazynka near Minsk, the youth organisation Talaka – near Gomel. Peace Gallery photo project is just two weeks but more than 70 people have participated in it. The author of the project, a photographer Alexander Zharnasiek implements his idea to make a gallery of portraits of positive people who oppose the war. Anybody can become a participant of the Peace Gallery. The Fund of Ideas delivered CSR awards. On 21 March the National Art Museum hosted an award ceremony in the field of corporate social responsibility (CSR). The event was organised by the Fund of Ideas for the first time. The awards went to the best CSR projects of Belarusian business companies in seven categories, for example, the company Velcom was awarded for the best CSR project in cooperation with the local community (the project VELOCITY); socially responsible media was recognised a state-run informational agency BelTA. MinskFun competition indicates the Minsk urban problems. The independent Minsk portal CityDog.by composed a tentative list of Minsk urban problems that should be solved in a non-standard way. Mapping of problems is done in the framework of the MinskFun open competition announced by Volkswagen and CityDog.by to improve the urban environment of Minsk; the winner receives $1,500 for the implementation of ideas. Among the identified problems are lack of parking, lack of public toilets, dog feces on the streets, etc. Acting with Unlimited Abilities 2014. The Association School of Leaders (Poland) and the Office for the Rights of Persons with Disabilities (Belarus) invite to participate in the second round of the Acting with Unlimited Abilities project. The purpose of the program is to strengthen organisations and informal groups of persons with disabilities through capacity building and leadership development. Participation in the program is available for nonprofit organisations or initiative groups of persons with disabilities or working for the benefit of this social group. The EU remains committed to a policy of critical engagement towards Belarus. On 27 March the European Commission presented updates on the progress made by the countries in its Eastern Partnership program. The report, in particular, acknowledges that the EU-Belarus relationship is still dire but there has been a positive trend in "Belarus's cooperation with the international community on some specific issues, namely the death penalty and the higher education." EBRD is to allocate €500,000 to Belarus small, medium-sized business. The European Bank for Reconstruction and Development (EBRD) plans to allocate at least €500,000 for subsidies to small and medium-sized enterprises in Belarus in 2014. Non-repayable subsidies will be available for small and medium-sized business that has at least two years of experience on the market and with the personnel of 10 to 250 workers. The EBRD grants can be spent on consulting services. SYMPA held a session in Georgia. On 19-24 March the fellows of the School of Young managers in Public Administration (SYMPA) learned some basic reforms in the public administration in Georgia. The program included visits to the Ministry of Justice, Economy and Sustainable Development, Regional Development, University, as well as meetings with MPs and local experts. The next session will be held in Sweden with a special focus on the management of public finances. Academy of the First 2014. Belarusian National Youth Council RADA invites to participate in its regular educational course Academy of the First aimed at preparing youth activists to be efficient in building the youth CSOs and manage them. The educational course consists of 5 workshops, a series of public activities, homework and pilot projects. Young people of 18-31 years, representatives of Belarusian youth organizations and initiatives are invited to participation. Golden People at Golden Age nomination for journalists. Golden Age University announces its nomination for journalists within the national contest at the IV Festival of Youth Journalism Your Style, which is to be held on 16-18 May in Hrodna. The nomination accepts journalistic materials demonstrating active life position of older people who retired, but did not lose optimism and show that anyone can be useful to society at any age. This is the main purpose of the Golden Age University, an educational program implemented by the Hrodna-based Third sector Centre. The MediaBarCamp 2014 continues to accept applications until 7 April. The 7th International MediaBarCamp will be held on 1-4 May 2014, in Lithuania, and dedicated to using new opportunities of Internet media and development of media activism. This year the MediaBarCamp is organized around the celebration of the 20th anniversary of Belarusian national domain .BY. Organised by Swedish International Liberal Centre (SILC), the MediaBarCamp invites all participants – media, public and political organisations, etc. – to present their projects online and find like-minded people. Belarus’ economy is showing its first signs of vulnerability due to its ties with Russia as its dollar bonds began to drop in value. Lukashenka’s initial critical stance on Russia’s invasion of Crimea develops into an admission that there is nothing the world can do about it, a message that concerns the West. The head of an opposition party is imprisoned for 15 days after taking place in a demonstration with political prisoner shirts. The opposition says it was campaigning for 23 March local elections when they were arrested. Meanwhile, local police stage a fake bicycle accident on the side of a busy road to attract the attention of drivers, but see only modest success. Belarusian poet Uladzimer Nyaklyaeu receives a prestigious literary award from the Swedish PEN organisation, though only after two years of not being able to leave Belarus and claim it. All of this and more in this edition of the Western Press Digest. Western Inspectors Fly Over Belarusian and Russian Borders – The International Business Times reports that the United States and Germany are going be making observational flights over the borders of Belarus and Russia. The flights are being made in response to reports that there are Russian military forces gathering there. These inspections will be done in cooperation with both Belarusian and Russian representatives who will also be on the flights. 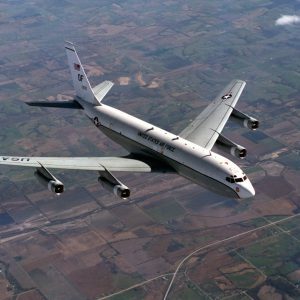 Observational flights are possible as all countries involved are members of the Open Skies international treaty, which they all signed in 1992. Lukashenka Critical of Crimean Land Grab, Then Endorses It – Belarusian leader Aliaksandr Lukashenka has publicly spoken on the ongoing crisis in Ukrainian, voicing his support for Ukraine’s territorial integrity. While critical of the way in which the Yanukovych regime was deposed of, he is now more concerned about the dangerous precedent set by Russia’s invasion of Kyiv. Despite his misgivings, Lukashenka stated that whatever people may wish to believe, Crimea is now de facto a part of the Russian Federation and the question of official recognition of this fact is not at all important. Belarus Bonds Drop Due to Ties with Russia – The intertwined economies of Belarus and Russia received attention from Western markets, as Belarus experiences rising yields on its dollar bonds. With concerns that Russia might invade eastern Ukraine, Russian markets, investors are weary of buying up Belarus’ dollar bonds as EU and US political, financial and economic pressure is mounting against Russia for its invasion of Crimea. Opposition Party Head Jailed for 15 days For Campaigning – Anatol Lyabedzka, head of the United Civic Party, and several activists were arrested while attending a rally in a central Minsk marketplace. They gathered there to campaign for open seats in the 23 March local elections. Authorities soon took notice of the gathering, where many of the protestors were donning shirts with pictures about political prisoners, and soon broke up what they would later all an “unlawful gathering”. Anatol Lyabedzka was sentenced to a 15 day jail sentence for his alleged violations. Belarusian Journalist and ex-Political Critical of West Inaction – In a recent interview with France 24, Natallia Radzina, a journalist, former political prisoner noted that while she was hopeful that Maidan would spread like a virus throughout the region, realistically it was not likely. Such a movement in Belarus would not be possible, given the strict control the authorities exert over any form of public demonstration. The journalist, who fled Belarus in 2010 after being persecuted by the authorities, said that while the West has taken action against the Belarusian leadership for its human rights violations, these measures have been half-hearted and ineffective. While introducing sanctions against people in Russia and Ukraine could hit their pocketbooks, the West using financial sanctions against the Belarusian authorities has little effect since they have no Bank accounts in the West. Uralkali Interested in Renewing Ties with Belaruskali – the Financial Times reports that Russia’s potash giant Uralkali has not lost interest in cooperating with old partner Belaruskali and hopes to work together again in the near future. Two of the shareholders who are pushing for a renewed partnership, Uralchem and Onexim (both Russian companies), each acquired their roughly 20% shares in Uralkali last year after the Russian government ousted former shareholder and billionaire Suleiman Kerimov. Belarusian officials previously stated that they would only consider a renewed partnership if the reformed joint Belarus-Russian project was headquartered in Belarus, an unattractive prospect for Russian business given Belarus’ previous detention of Uralkali’s CEO. Financial times re-quoted a non-executive Director, who stated that it would be very difficult to bring the two sides back together again. Belarusian Poet Receives Swedish PEN Award Two Years Later – RFERL reports that after a long wait, Uladzimer Nyaklyaeu was able to accept his Swedish PEN organisation’s Kurt Tucholsky Award. The Kurt Tucholsky award is named after a German-Jewish author and journalist who persecuted by the Nazis and saw his work banned in Germany. Nyaklyaeu, a famous Belarusian poet, declared the winner in November 2011, but could not claim his award due to a ban on his leaving the country set by the Belarusian authorities. Nyaklyaeu received the award not only for his prowess as a poet, but also for his work in advocating freedom of speech. Apparent PR Stunt by Police Warns of Dangers of Bicycling – The BBC is reporting that that the Belarusian police placed a dummy beside a downed bicycle on the side of a busy highway to make it appear as if a person had been hit. This PR stunt is part of the larger Don’t Look the Other Way! Campaign in an attempt by the authorities to reduce the number of incidents on roadways. Of the 186 cars reported to have driven by the staged accident, only five stopped.